Lock in a great price for Panorama Lodge and Restaurant – rated 9.3 by recent guests! The Panorama is easily the best lodge in Namche. If the clean rooms, en-suite bathroom, electric blankets and spectacular views aren’t enough then the wonderful staff and friendly owners will certainly capture your heart. I’ve stayed here 9 or 10 times and never been disappointed. Comfiest, cleanest and nicest place I stayed in on my 12 day trek. I stayed in the basic rooms and the deluxe rooms. 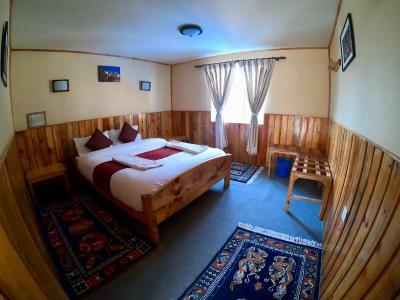 the basic rooms were as expected (no insulation, use your own sleeping bag, communal toilet and shower) but the deluxe rooms were above and beyond with big beds with clean sheets, private bathroom, and insulated rooms with wifi. The food was good and the staff were all excellent. Laundry service was prompt and efficient. I have zero complaints. From the facilities to the staff to the food. The proprietor and his wife are the real deal!! Elegant hotel, well run and affordable. Good hotel. 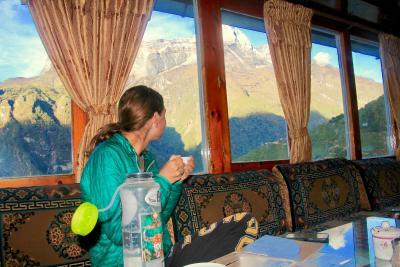 It locates on the top of the hill, so the view onto Namche and mountings around is perfect. Spent 2 nights on the way up and one night on the way down. Meals are perfect. Staff and Mr. Mingta (chief) are professionals and kind persons. 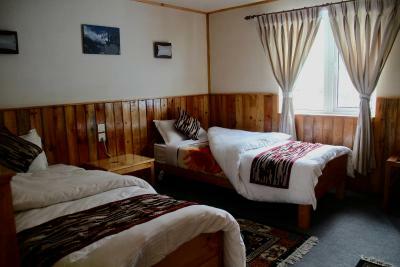 If you look for a comfortable place with personal bathroom and hot shower in Namche - it's a good choice. This place is like a home away from home. 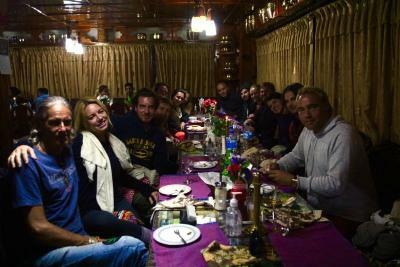 The host and his family and staff are very warm and welcoming people. Nothing is a problem. 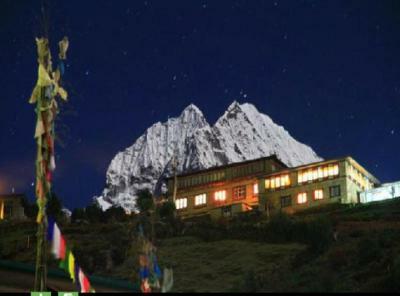 The room was great with the best views of Namche, a warm bed, and big bathroom with hot shower. Food is excellent. They have laundry service which is quick so we could wash our clothes after our hike. The last day we had to leave early and got breakfast at 5:30am which was earlier than official breakfast hours. Will definitely stay again. The location is really great in an elevated position with fantastic views over the village. Nice hotel, and comfortable rooms. Perfect for pre and post trekking! 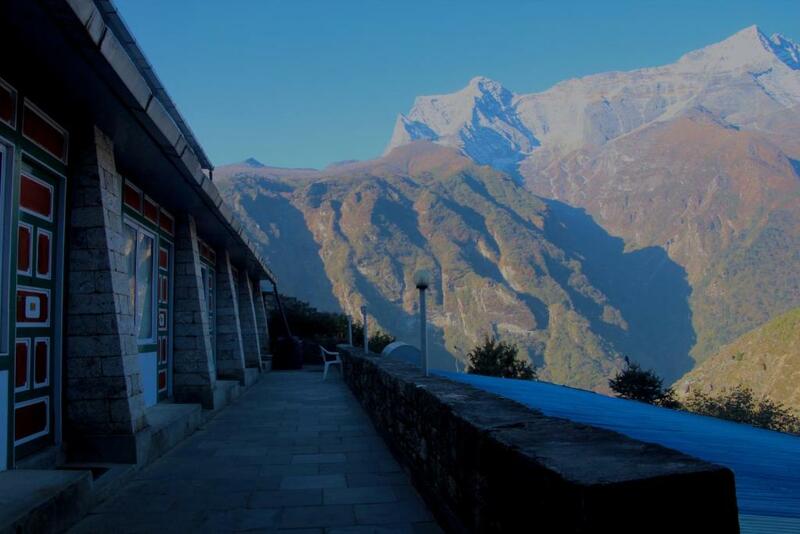 Perched atop Namche Bazar Hill, Panorama Lodge and Restaurant offers rooms with mountain views and free Wi-Fi. 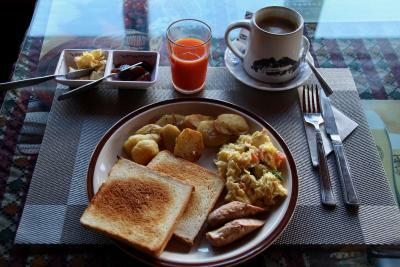 A 5-minute walk from the Saturday Market, the eco-friendly lodge has its own restaurant. 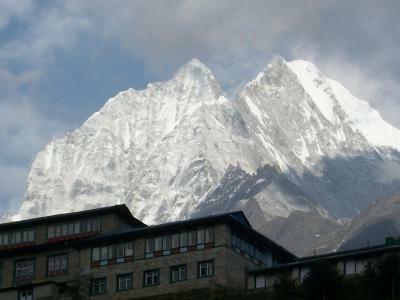 Located along the trek to Mount Everest, Panorama Lodge is 1,650 feet from the National Park Museum. 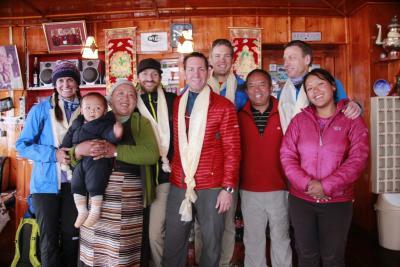 Tenzing Hillary Airport or Lukla Airport is 8.1 mi from the lodge. Each room features an electric bed warmer, wardrobe and seating area. 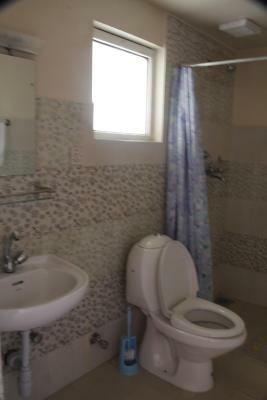 Private bathroom comes with a shower, toilet and running hot water. Guests have access to a 24-hour reception, which offers luggage storage facilities. Local and European cuisines are served at Panorama Restaurant. The closest airport is Tenzing Hillary Airport 16 mi away. This property also has one of the top-rated locations in Nāmche Bāzār! Guests are happier about it compared to other properties in the area. This property is also rated for the best value in Nāmche Bāzār! Guests are getting more for their money when compared to other properties in this city. When would you like to stay at Panorama Lodge and Restaurant? 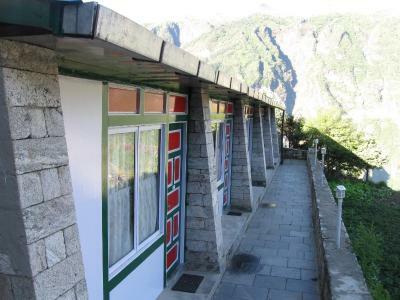 Offering mountain views, room features an electric bed warmer, wardrobe and seating area. Private bathroom comes with running hot water. 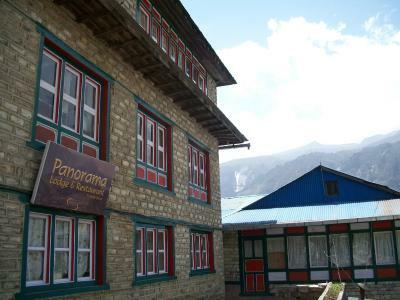 Panorama lodge is a home away from home for many elite climbers and trekkers. House Rules Panorama Lodge and Restaurant takes special requests – add in the next step! All older children or adults are charged USD 18 per person per night for extra beds. Panorama Lodge and Restaurant accepts these cards and reserves the right to temporarily hold an amount prior to arrival. Please inform Panorama Lodge and Restaurant of your expected arrival time in advance. You can use the Special Requests box when booking, or contact the property directly using the contact details in your confirmation. The beds had electric pads, but the rooms were still so cold! 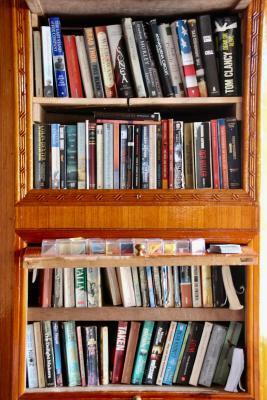 The room was much more basic than those shown in the images. We thought it was a little pricey on this basis. Great coffee! Very hot shower and electric blanlet was lovely! Very personal welcome. The hosts are wonderful people that genuinely care about you. 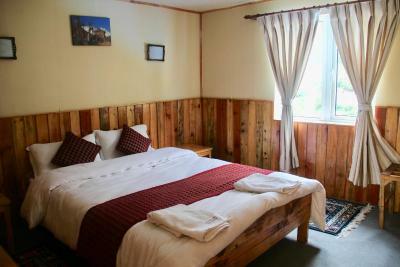 Rooms have (based on selection) electric blanket, private bathroom, hot shower, towels, comfy bed. 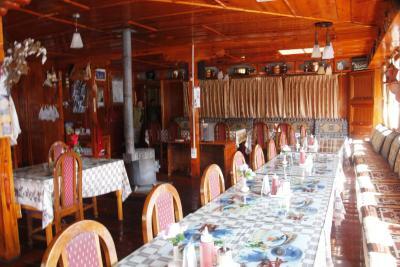 The common area / restaurant is cosy and the restaurant serves great food. 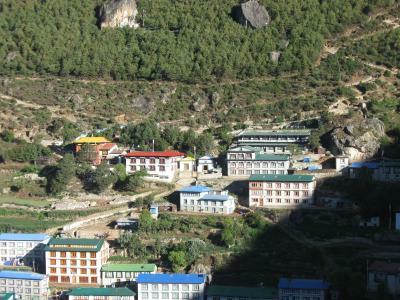 Some of the best views over Namche if you are prepared to hike up a few extra steps from town. After staying in freezing tea houses for weeks this was the perfect place for a relaxing night in a comfortable bed with warm heated blankets. We had a spacious room with own bathroom facilities. The hot shower worked perfectly fine. 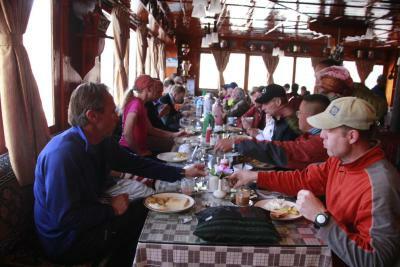 The owner warmly welcomed us and the staff was very helpful and attentive. We can only recommend this place! Very confortable lodge with a good restaurant. 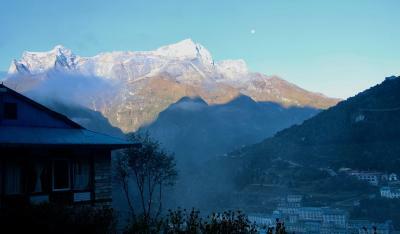 Amazing mountain view and Namche-Bazaar, your toilet and hot shower. Bed heated. El trato. Todos muy muy amables, super serviciales. La habitacion muy comoda, frazadas electricas ! Un lujo! Ming and his family are the best!